Brixton Station Passageway has been an empty eyesore for some years now with Network Rail having closed down and moved on the local businesses who used to occupy the space. The passageway was cleaned up in September 2017 for a week-long creative takeover by a group of emerging and established designers and makers from the Brixton area occupying traditional kiosks and small shop spaces as part of Brixton Design Trail 2017. Throughout December 2017, local designers and artists were given the opportunity to take over the passageway to utilise and draw positive experiences from this otherwise empty space space in Brixton. 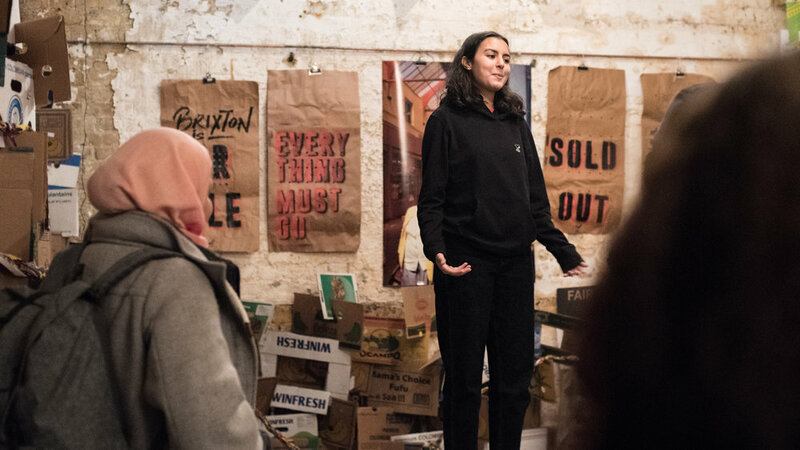 Passageway opened with an installation built by Resolve Collective, artwork and pop up shop by Chillcreate the 'Passageway featured talks, performances and pop up markets featuring artists and designers from the Brixton area. Also exhibiting in the passage was Brixton artist Farouk Agoro, who's pop up exhibition “Feeling Some Type of Way” was a beautifully colourful and invigorating passage takeover. The artwork I created for this pop up was spray painted onto the brown paper wraps found in the market banana boxes. I wanted to make a statement on how the market is for sale, literally and that it is being sold out by the owners and leaders of Brixton. "Passageway is a meeting of ideas and concepts surrounding the ever changing space in our beloved Brixton" - Carolyne Hill, Chillcreate. "We will utilize surplus cardboard containers sourced from Brixton Market and other shops and supermarkets in the local area to construct three wall-length structures for the space. The design aims to connect the space to the surrounding systems of trade, commerce and cultural exchange in the market by re-imagining an essential component of the market’s infrastructure as an essential part of the space’s structure. Additionally, these structures act to reconfigure the blank wall space, challenging conventional ways of exhibiting visual work and staging talks and performances." Akil Smith, Resolve.